Pyrimidines fused with pyran ring are called pyranopyrimidines. The fusion is necessarily at the 4, 5 or 5, 6 carbon atoms from the pyrimidine ring. The pyranopyrimidine derivatives have immense importance in synthesis as well as in biological chemistry. Various pyrano pyrimidines are present in alkaloids, carbohydrates, polyether antibiotics and natural products. The pyrano pyrimidines possess several antimicrobial, antifungal and potent in-vitro antibacterial activities. The work has been a continuation of our work from the series of twelve books as Pyrimidines, Quinazolines, Pyrimidines fused with heterocyclic rings, Novel Pyrazoles part I, Novel Pyrazoles part II and Triazolo-Pyrimidines, Thiazolo-pyrimidines, Triazolo-Quinazolines, Triazines, Thiadiazines, Oxadiazines and Chromenes. 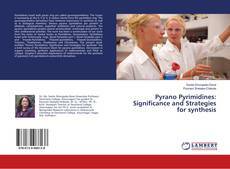 The present book entitled “Pyrano Pyrimidines: Significance and Strategies for synthesis” has a brief survey of the literature taken for pyrano pyrimidines, microwaves in organic chemistry, synthetic applications of malononitriles and PSSA as catalyst. Chapter-5 describes Applications of malononitrile for the synthesis of pyrano[2,3-d] pyrimidine-6-carbonitrile derivatives.